A great job of writing and directing by the famous John Waters. Although not hte most famous, this movie is about as mainstream you will find from John Waters. Kathleen Turner is a natural in one of her best roles as the Serial Mom. Her ability to pull of the great mom image while whacking away at good and bad alike, always doing the dirty work for all that mention their desires to rid the world of friend and foe alike. Sam Waterston, Ricki Lake and Suzanne Somers like Kathleen lend credibility to the movie and actually give it some class. A file by John Waters that cannot be missed. Waters succeeds yet again in a great parody of one of his personal favorite subjects- the American obsession with crime,murder and celebrity. To give to much introspection in into the topic would be contrary to Water's own philosophy that a film is not meant to change your life -rather it's a pleasant way to spend two hours. And- it this is a pleasant two hours. This is certainly one of Waters most accessable films in terms of content, and only so many "in" jokes take place. A cast of well-known actors shares the screen with our favorite Dreamlanders. If anything- it's unusual in the fact that it's a comedy that is actually funny.Also-apart from children-you can watch this film with just about anyone - and not have the less open-minded go running from the room as some would during a Pink Flamingos or Female Trouble. 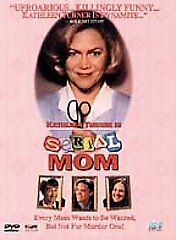 "Serial Mom" combines the prim and proper housewife/mother ala 1950s, Beverly Sutphin (Kathleen Turner), with the deadliness of a serial killer to make for a delightful black comedy. It all starts when a neighbor steals her parking place and Beverly retaliates with obscene phone calls (this movie was made before Caller ID). Then at a PTA conference, when the math teacher tells her that son Chip has an unhealthy obsession with sick horror films, she later runs him over with her station wagon, and immediately proceeds to the car wash where she is greeted by familiar faces. Husband dentist Eugene (Sam Waterston)is amazed how happy, energized, and hot she sometimes becomes. After a boyfriend of daughter Misty (Ricki Lake) appears to have dumped her, he gets offed at an indoor flea market and Beverly returns to her booth telling a friend "I made a killing." You'll find a lot of jokes like this and numerous sight gags such as the cop car procession in the course of the six or so murders, all executed with various household items. Don't recycle? Don't wear your seat belt? Don't rewind your rental VHS tapes? Watch out. I really like the scene at a downtown Baltimore club where a girl band is playing and Serial Mom's activities become part of the performance. When her case finally comes to trial, Beverly takes on her own defense and manages to discredit the witnesses. But there is the question of what to do about the juror who is wearing white shoes after Labor Day. Suzanne Somers also makes a brief appearance. The bonus features on the DVD add to enjoyment. You get a featurette which is a sort of extended trailer showing the crew making the movie and includes comments by writer/director John Waters. There are also bios and filmographies for all the major stars plus Waters, and theatrical and TV trailers. There are at least 3 editions of the "Serial Mom" DVD. In ascending order of value, the lowest priced and most common has a UPC ending in 98024. This has a pink cover and is Full Screen only. Next up is UPC 27489, the collectors' edition, Widescreen, showing Beverly outdoors in a polka dot dress. Finally UPC 25303 is the Mother's Day Mama Mia Promotion edition and contains both Full Screen and Widescreen versions. If the edition you're looking at seems to be priced too low for what it is, you might consider checking with the seller to make sure the listing has the correct UPC. But if a dark comedy is what you're after, whatever edition you eventually purchase, you're sure to enjoy the movie. Just be sure to observe the willing suspension of disbelief. In the "so bad it's good" category, this is at the top of its class, especially considering it had to have been made with dorkiness in mind. After a few minutes of Donna Reedish family life that makes you want to puke, things start to get interesting as soon to be serial mom Beverly Sutphin begins harrassing and then killing her victims over chewing gum, not rewinding videos, taking her parking spot, etc... The melodrama exhibited by some of the supporting cast is great, and Kathy Turner's facial expressions are classic. This movie contains a lot of small details that make one say "nice touch," meanwhile bearing in mind that this movie is, in actuality, complete crap. If you like dark comedies, I strongly suggest checking this one out. A great mom to have.....Serial Mom. This is the best movie because how many times have you wanted to kill people for the stupid things they do? Well, Kathleen Turner does just that. From killing a guy for ditching her daughter, or the woman that doesn't rewind a movie, it's the stuff people would kill for. Mink Stole and Ricki Lake are back in another John Waters film in fabulous roles. This film makes Suzanne Sommers even seem like a great actress.